Trekking in beaten path inside Annapurna conservation area by exploring unspoiled natural and cultural trail. 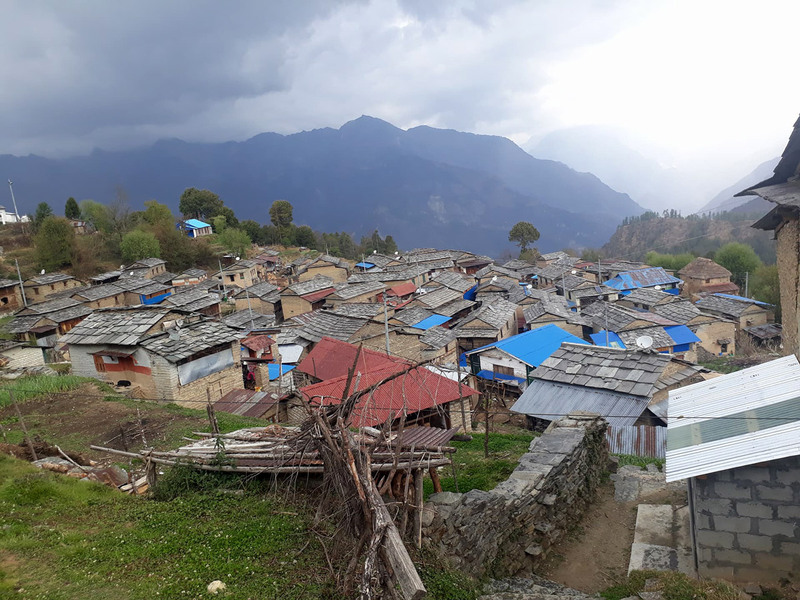 Mohare Danda Trekking is trekking in community Eco trail off the beaten trekking in foothill of Annapurna and an alternative route from crowded Ghorepani and Poonhill. Trail was open in 2010 with the objective of developing the community with the tourism and support community based schools in the villages from its income. Community lodges and community home stay run by friendly locals are the accommodation during the trek. Trekking route is mixture between fabulous landscape and great cultural experience. Dense forest of Rhododendron and Orchid flowers is path of trekking. You will find real Nepali cultures with local peoples who are not really business mind as others in regular trekking areas. The highest hill you reach at Mohare hill is 3,300 miters can explore high mountains like Annapurna I of 8091 miters, Mount Daulagiri 8167 miters, Machhapuchre 6997 miters, Annapurna South 7219 miters, Nilgiri 6820 miters, Tukuche Peak 6920 miters and more. 6 days short trekking starts from Galeshowr which is about 4 hours drive from Pokhara. Stay first night at Bas Kharka and second night to Nagi, third day to reach Mohare Danda the main attraction of the trek. After exploration, we trek down to Pokhara via Danda Kharka and Tikot by another 3 days. Communities around Mohare are adopting eco friendly practice for safe drinking water, micro hydro electricity and solar electricity. Entire trekking is lead by our professional trekking guide and porter team. Total 10 days program is including your arrival and departure dates to and from Kathmandu. This trekking also has option to add some more days for trek towards other famous trekking sites of Annapurna. Ghorepani Poonhill, Khayar Lake Khopra Danda (another beaten trekking trail inside Annapurna) Jomsom Muktinath, Lower Mustang are the relative nearby trekking destination from it. Trip also can be included exploration of heritages sites of Kathmandu valley, adventure activities in Pokhara like paragliding, bungee jumping, ultra flight, Heli flight to Annapurna base camp, boating tour at Lake Etc. Cost of the trip shown in our webpage can be less or up, as per service category you require. Instead of driving, you might choose to fly Pokhara, may choose private transporation instead of taking regular tourist bus in this sectore. You also can reduce the cost by choosing simple accommodation in Kathmandu and Pokhara instead of 3 star category hotels. Hotel upgrading to 4 or 5 star is only possible in Kathmandu and Pokhara not in trekking trail. Mohare Danda community eco lodge trekking trail is less crowded and beaten path trekking trail inside Annapurna conservation. Short trekking can be optional from crowded regular trekking route like Gorepani Poonhill and Ghandruk. You also have option to add some more trekking route with this trek or any other activities in Pokhara, Kathmandu, Chitwan, Lumbini. Let us share your plan to provide you complete plan and information by our professional team. Day 2Drive or fly back to Pokhara. Overnight at Hotel 827mDrive with tourist bus or private car to Pokhara takes 7 hours. Option to take day Rafting trip in Trisuli River or Cable car tour to Manakamana temple. If you willing to take flight, it is 25 minutes from Kathmandu to Pokhara airport. Check in hotel and overnight at Pokhara. If time permits, boating at fewa lake, visit international mountain museum, David falls, Gupteswor cave and drive to Peace Pagoda are in the optional activities. Day 3Drive to Galeswor (4 Hours) and trek to Bas Kharka (1525m) 3 hours Overnight at Home stayDrive either with local bus or with private jeep to Galeswhor. 4 Hours drive from Pokhara across Beni Bazzar. We can shortly visit Galeswor, the famous Hindu temple. Cross suspension bridge over Kalilgandaki River in Galeshow. Starts uphill trekking in warm temperature mostly crossing local village of Magar community. Day 4Trek to Nangi (4-5 Hours) 2,300m. 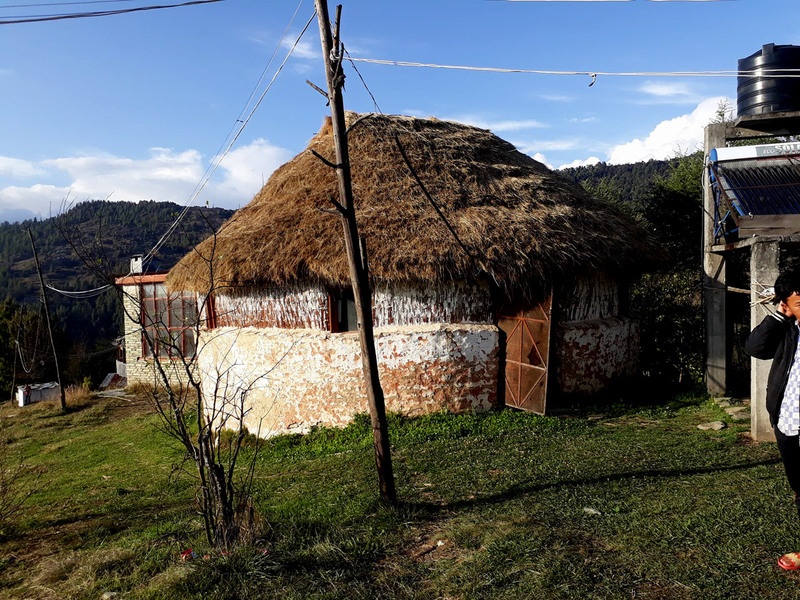 stay overnight at Eco community lodge Day is the great exploration along the village and its organic farm school as well as Nepali paper factory. Visiting the main Magars village and center of the Eco community lodge trek. Trekking trail is well maintained mostly stone staircases ups and down. The view of Dhaulagiri ranges are well visible from on the way. Stay at the community Lodge overnight including all the foods. Day 5Trek to Mohare Danda (6/7 Hours) 3,300 m. Overnight at Community Lodge Reach at final and majestic view point Mohare ridge. Trekking trail leads us forests of rhododendrons, Oak and Bamboo to Mohare Danda. It provides the most beautiful, majestic Mountain View of Dhaulagiri and Annapurna range including over 8 thousand mountains Annapurna I and Dhaulagiri. The place is the best for amazing sunset as well as sunrise view. Day 6Enjoy breathtaking Himalayan views and best sunrise. Trek to Danda Kharka (3 Hours) 2,800m. 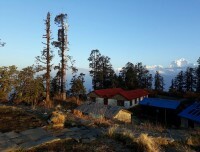 Overnight at community home stayEnjoy morning walk up to the hill for sunrise and Himalayan views near Mohare Danda community lodge. After breakfast, trek to Danda Kharka. Short trekking towards our next Danda Kharka is located in the middle of the Rhododendron forest in one of the peaceful places. Day 8Trek to Tiplang (3 hours) and drive Pokhara (4 Hours) Overnight at Hotel mostly descending trekking way to Tipling. it is about 3 hours and get transportation back to Pokhara. 4 hours of driving can be with private transportation or with local transportation. stay relax at Pokhara after your trekking days. Day 9Drive or fly back to Kathmandu from Pokhara. Overnight at Hotel You have option to take half day sightseeing in Pokhara and drive with private car to Kathmandu. it is 6/7 hours driving. Another way is to fly back Kathmandu, it is 25 minutes. Flight is up to 3 pm. to make your cost cheap, option to drive back Kathmandu by tourist bus which leave early in the morning. Day 10End of the trip, departure You can still stay Nepal with your interested activities. Or drive to International airport for your final departure. 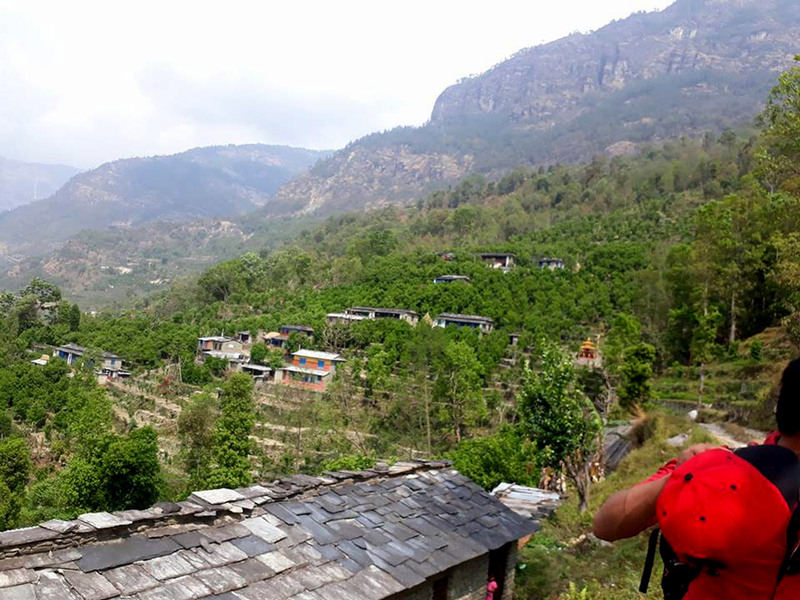 Mohare Danda community eco trail trekking is short trekking inside Annapurna conservation area. Group joining trekking is not require, even one pax can plan the trekking as per intrested date. Send us your passport scan copy by email and confirmation amount by online credit card payment system or bank transfer. We also need 2 copies of passport size of your picture at your arrival time. Accommodations in Kathmandu and Pokhara are in 3 star category hotels with breakfast on twin sharing room. Communities manage local tea houses are the accommodation on the way of Mohare trekking. 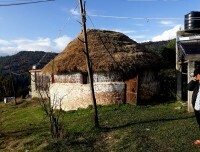 Same guest houses on the way of trekking provide tourist standard local foods. Breakfast and dinner is at same lodge we stay overnight, lunch on the way local restaurant. Partly payment about 25 % of total amount of the trip is advance paying. Rest of the payment is in your arrival dates. Free cancellation charge of the trip cancel before a month from trip start date. 25 percentage cancellation charge will be applied cancel trip latter than a month time.